I write in response to the National Grid’s north Wales Connection Stage 2 Consultation, to once again express my opposition to the proposed plan for a new corridor of overhead transmission cables and pylons across Anglesey, and my favouring of an alternative solution. •	More and more constituents are contacting me daily, disappointed and angered by the proposals. •	My constituents have little faith in this consultation process. They have concerns that many people are still unaware of the ongoing consultation, or are unaware of its significance and potential impact on their lives. •	It is disappointing that, even though the Grid’s first consultation showed that the large majority of people were not in favour of pylons, the second consultation is still concentrating on this option. Anglesey has spoken clearly on this matter and we do not accept that overhead lines are the only option. •	National Grid admits that an alternative such as an undersea cable would be technically feasible, though challenging, but it’s cost that seems to be the key factor. That means that the people of Anglesey – through the impact on their landscape, the value of their properties and the local tourism industry – are being asked to subsidise energy prices for the rest of the UK. Yes, an alternative would be more costly, but that would mean the sharing of the project costs among millions of electricity bill payers, spread out over a period of decades. I sincerely believe it is time that more weight is given to alternative proposals. •	All options should still be on the table – undersea and underground. •	National Grid announced that pylons were to be replaced with underground cables to improve scenery in Snowdonia, New Forest and the Peak District. This was recognition of the need to ensure that our environment is protected and that consideration needs to be given to more than just cost. The same consideration should be given to Anglesey’s environment. 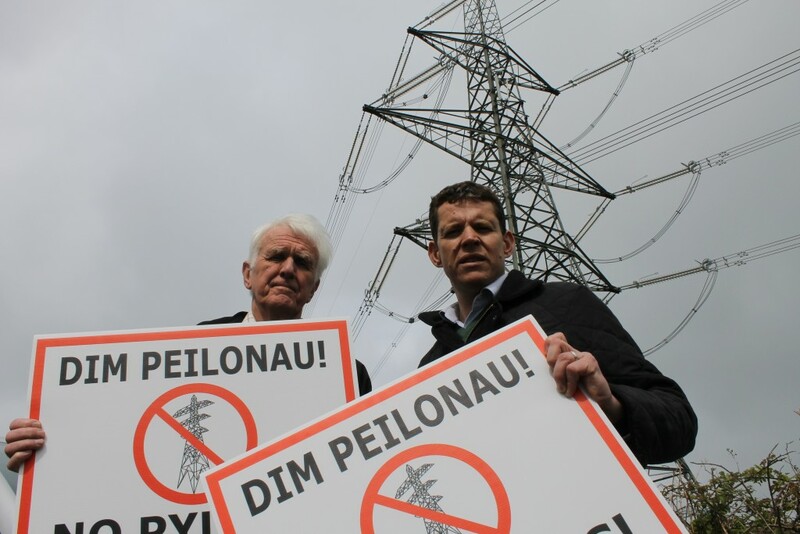 Anglesey may not be a national park, but as we face having a second line of pylons across the island, the Grid must acknowledge the damage that that would cause and look again at how we can seek an alternative solution. I will not be commenting on various route proposals. In inviting people to state their preference for one route variant over another, you are asking my constituents to approve the principle of an overhead line. National Grid must not ignore the core message which has been made clear in your ‘consultations’, which is that the vast majority of respondents, and a vast majority of the people of Anglesey, oppose ANY overhead cable development in the strongest possible terms. I ask you once again to consider carefully the concerns of local residents and to make the necessary investment in an alternative solution that would not have such a negative impact on the island’s environment, scenery, tourism, economy and well-being.